AvaLAN Wireless Systems has launched a new hardware-based VPN device that allows devices to be remotely accessible over a typical network without requiring remote firewall ports to be opened or fixed IP addresses assigned. FIPS 140-2 High Security Ethernet Network Appliance (Model# AW-HSNetAppliance)The AW-HSNetAppliance is fully FIPS140-2 Level 2 certified. Anyone in a government agency or sensitive private industry such as health care, energy or financial with a need to transfer sensitive but unclassified data is now required to encrypt this data with a method that conforms to NIST (National Institute of Standards and Technology) Standard FIPS 140-2. AvaLAN Wireless has developed a hardware encryption module (AW140) that has been validated by CMVP (the Cryptographic Module Validation Program) to FIPS 140-2 Level 2. The module is packaged together with an Ethernet interface in a device that can encrypt data in a FIPS 140-2 certified manner. 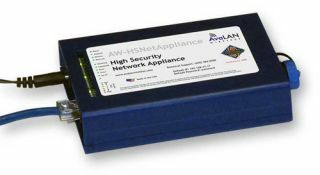 "AvaLAN's new secure network appliance product is opening new opportunities for anyone needing to remotely connect devices securely through the Internet," said Matt Nelson, chief executive officer of AvaLAN Wireless Systems. The AW-HSNetAppliance is used in pairs, one to encrypt data on the trusted LAN where the sensitive information originates, and the other on a second trusted LAN to decrypt the data at its destination. In between, the securely encrypted data may be passed over a public network such as the Internet. The two products together allow creation of a private and secure tunnel that provides a FIPS-validated data path.